Hello everyone. I'm new to the forum but have been stalking for a while. 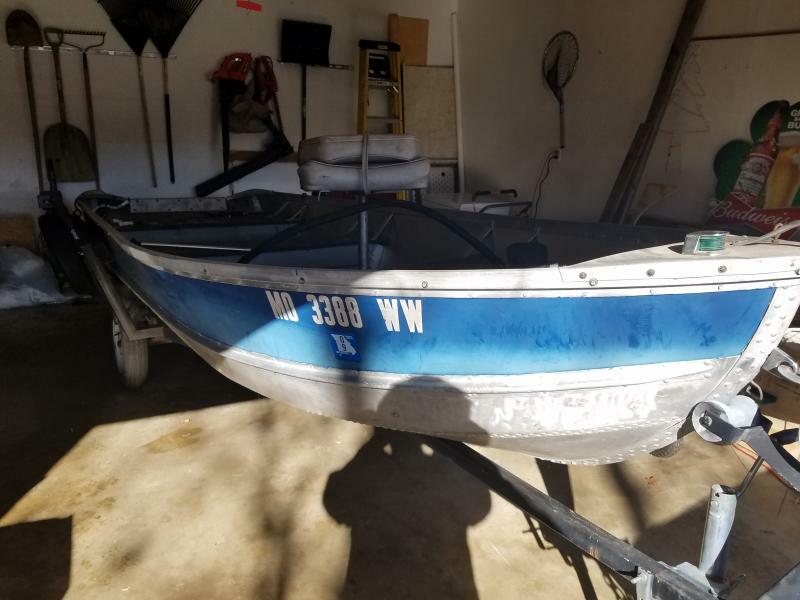 My wife and I bought our first boat today from our neighbor. I dont have the title handy but i know is a 60 something Rich Line. 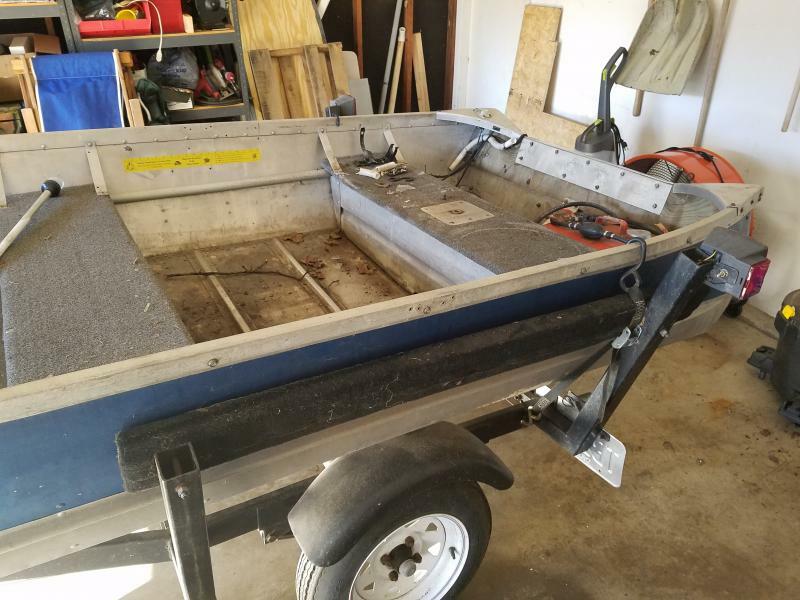 It came with the trailer, 2 older trolling motors, and an Evinrude 25hp outboard. Parked it in the garage at 12:00 today and got to work. here are some pics i took. i want to make a front and rear casting deck and flat floor. 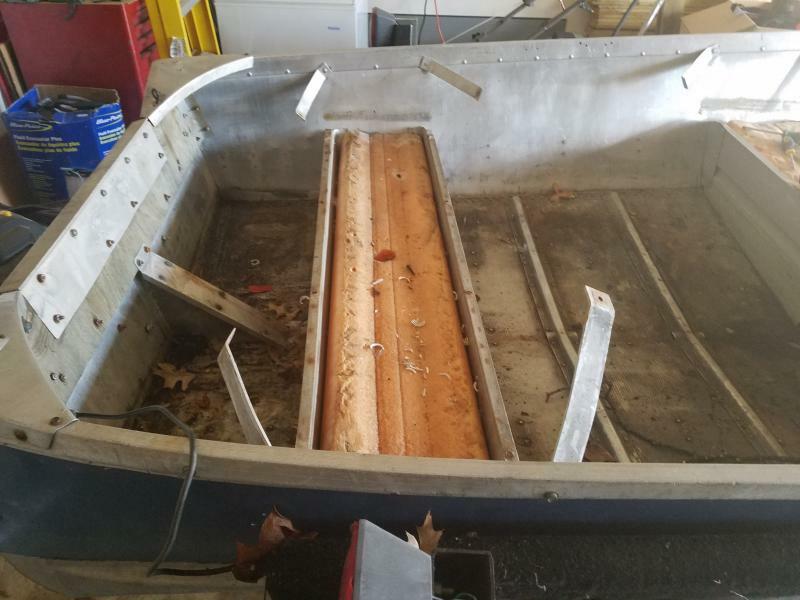 We would like to take out the center seat and the side braces but after stripping the boat it flexed ALOT. I was thinking of putting a live well in the center seat if it not able to be removed. I am looking forward to all the comments and ideas as this is my first build and i really dont was to sink the boat. By the way all rivets are solid and there are no leaks. 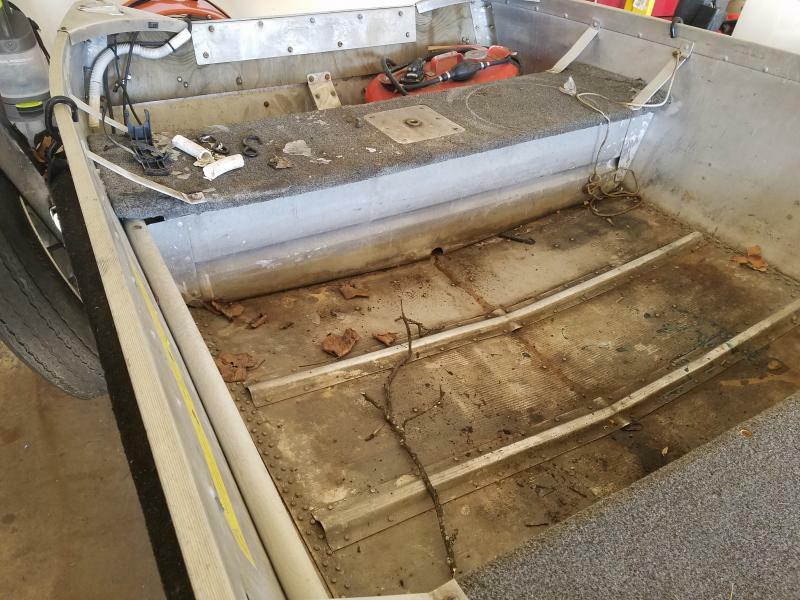 ... want to make a front and rear casting deck and flat floor. 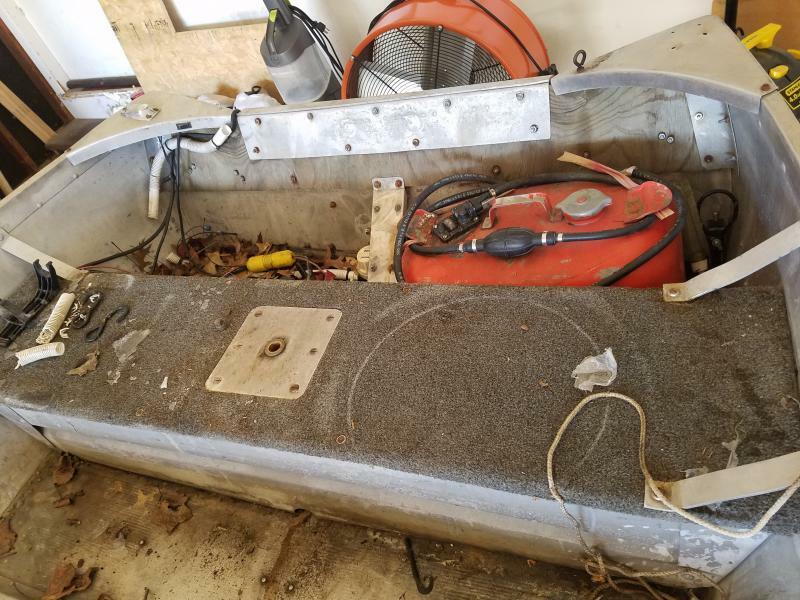 We would like to take out the center seat and the side braces but after stripping the boat it flexed ALOT. I was thinking of putting a live well in the center seat if it not able to be removed. I am looking forward to all the comments and ideas as this is my first build and i really dont was to sink the boat. 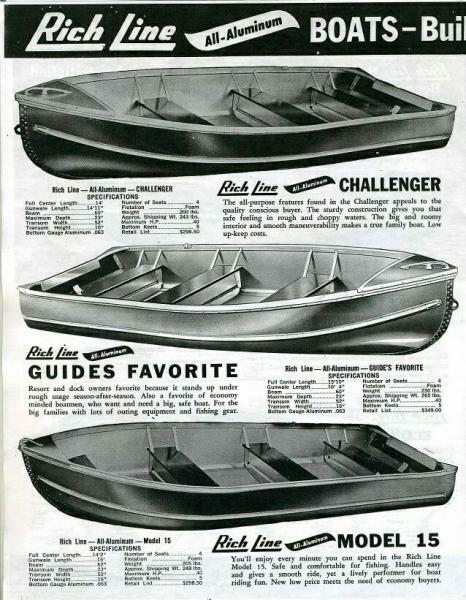 Secondly, I'll admit I'm a minimalist when it comes to flooring and boats smaller than 14' and/or less than 40hp. I cannot believe how much boat (and weight) some will cram into a little tin boat. But I guess if I was just on ponds and smaller lakes I'd probably try that too. For me, for use in rivers or saltwaters, I value strength, power and inherent stability over some creature comforts. 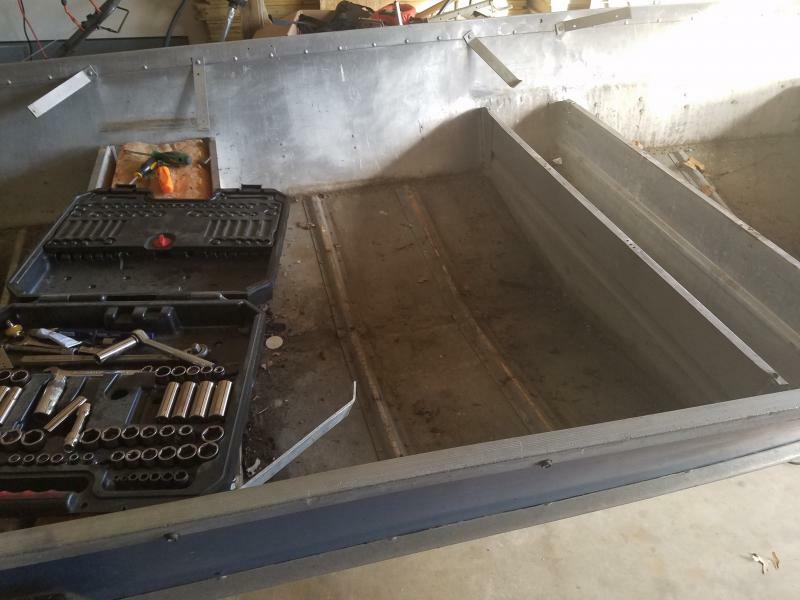 That said, I once took a sheet of 1/4" luan, cut it to fit the space between the seats on a 12-footer and stood on it to get an idea of the depth of the concave curve the piece had. I then jigged that up and coated it with epoxy where it cured as roughly bent to that curve. Put that piece in place and covered it with some rain mat-type rubber-backed thin carpeting. 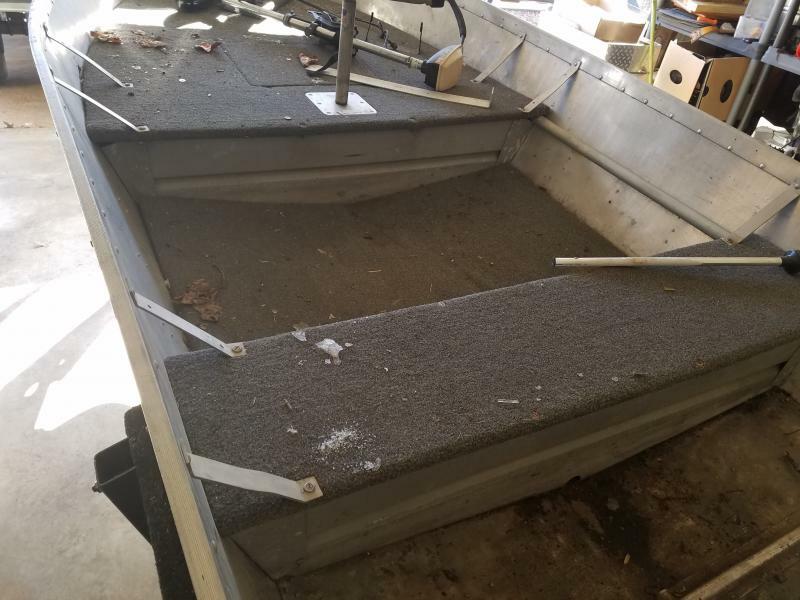 Not too much weight and it worked, albeit the floor wasn't perfectly horizontally flat, but still allowed easy and secure footing for moving fore & aft. 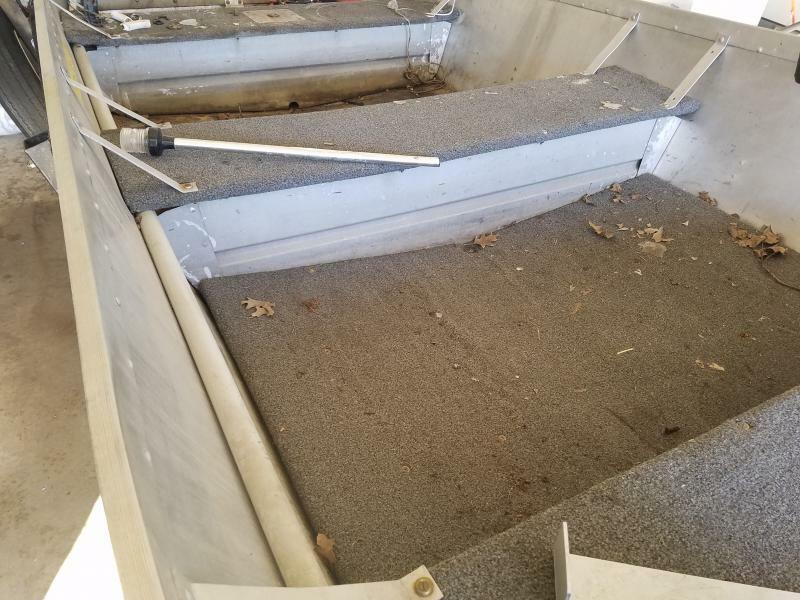 I'd consider flooring options so you could safely add the bow & stern platforms you're looking for. Nice rig and I'm sure others will chime, especially others who have done what you're seeking! In regards to removing structural components - it can be done - but you need to replace it with some other method to add back in the support. Some hulls with an open design use a "knee" from the top-sides to the floor to add back in that stability to the sides. Tin is going to move, but if it flexes beyond its elastic limits repeatedly, then stress cracks and/or fractures can begin to appear, i.e., think about severely bending a paper clip back and forth as an example. Thanks DaleH. This boat be on small lakes that you couls throw a rock across. There will be a couple bigger lakes it will be at but those are still smaller. Maybe 60 acre lakes at the most. Im wanting alot of ammenities and comfort due to my wife being with me most of the time. 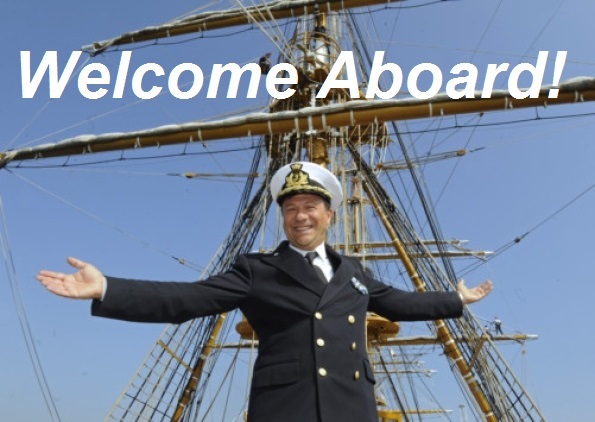 Maybe you have already found the vboat mod listing. If not, click the link above and go to the top to see the most recent posts. My mod is similar to what you are looking to do. Or you can click on my signature to see my post. My next question is what to coat the bottom exterior with. 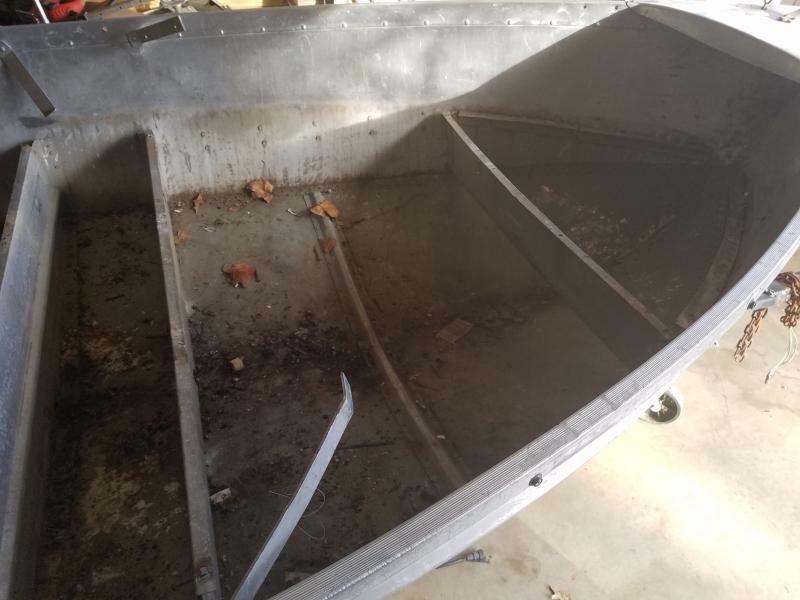 I see a lot of people using gluvit but I was told fiberglass was a no no to put on the bottom of these boats. I know own it's opoxy so I was wondering what you guys think or use. I was to seal it real good and some protection. Nice boat. That's pretty much the same boat I have. You can do a Google search & find specs on it. As far as the decks, you can look at my build to get some ideas. 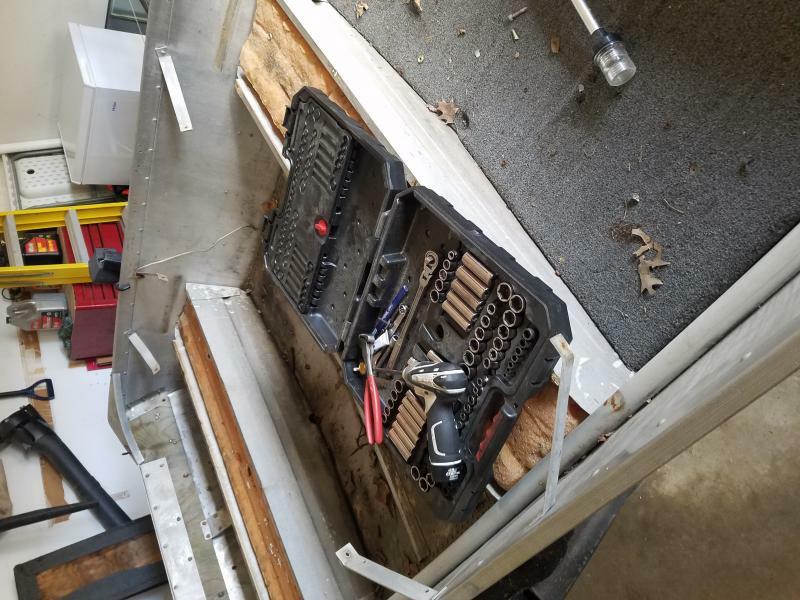 I am in the process of redoing it & will do some things different so that I can save some weight & still have good storage & deck space. 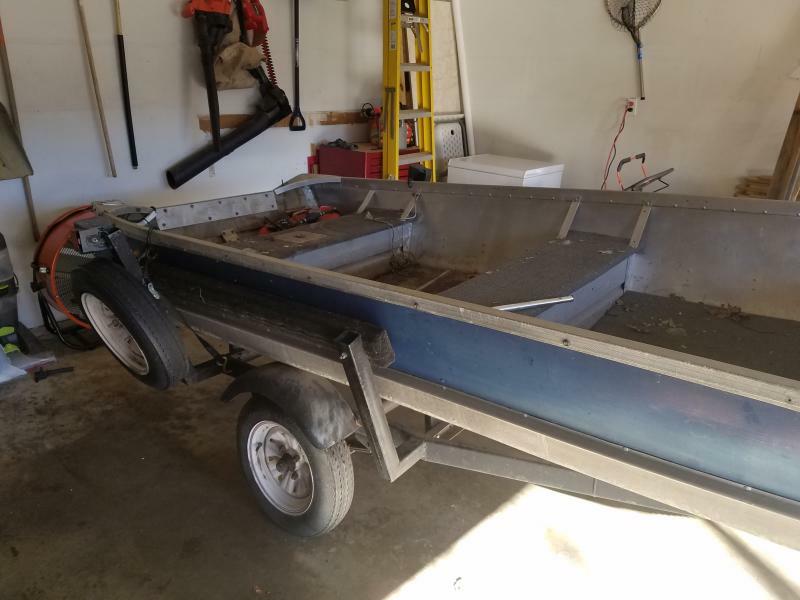 The added weight will make the boat more stable. Sinner by birth...Saved by the Grace of GOD!!! It's funny u say the rstewart. I just posted about trying to find weight specs. I found all the other specs but. One weight specs. 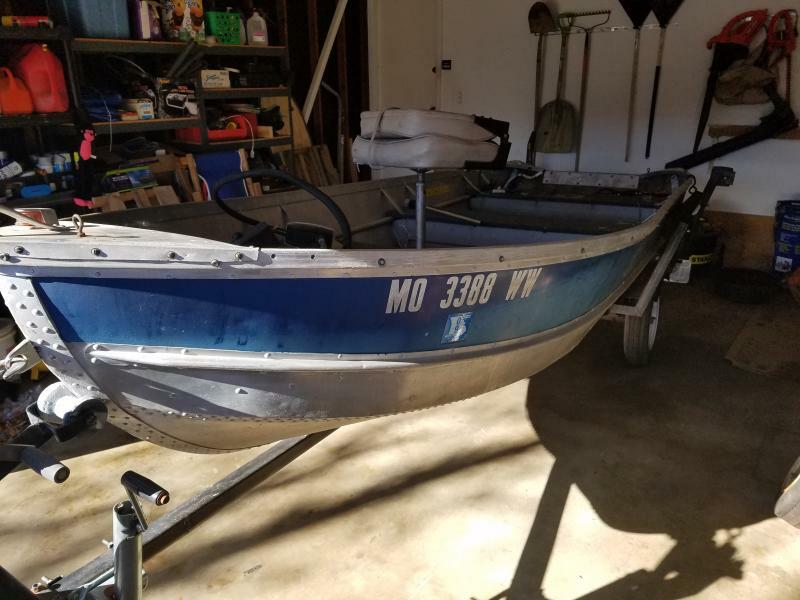 Do u have a link to your boat pics? For example, for a vessel 18 feet long by 6 feet wide, the number of persons is 18 times 6 (or 108) divided by 15, which equals seven 150-lb. persons (or a total person weight of 7 x 150, or 1050 lbs.). That would be 5.3 people @ 150lbs. each or 795 lbs. To make it trickier, they recently (since people are getting larger) have decided the average persons weight is 150lbs., but before that it was 134lbs. per person. All that being said, my vote (if you have a 60" beam) is that you may safely place 5 people, or 795lbs. people, motor and gear. 6 gals gas: 36 lbs. 500 pounds of people. We are pretty big peolle. 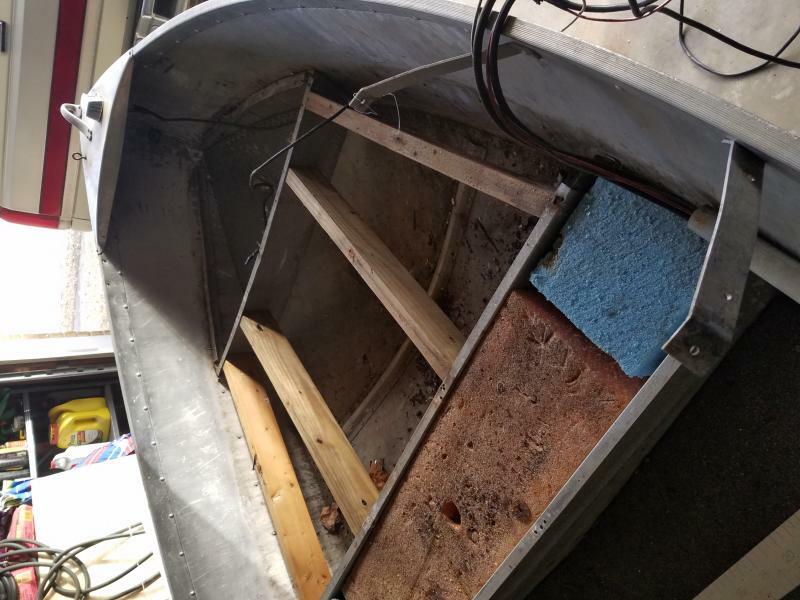 I believe the boat is 15.2 feet and 48 inches at Bottom with a 6ft beam. 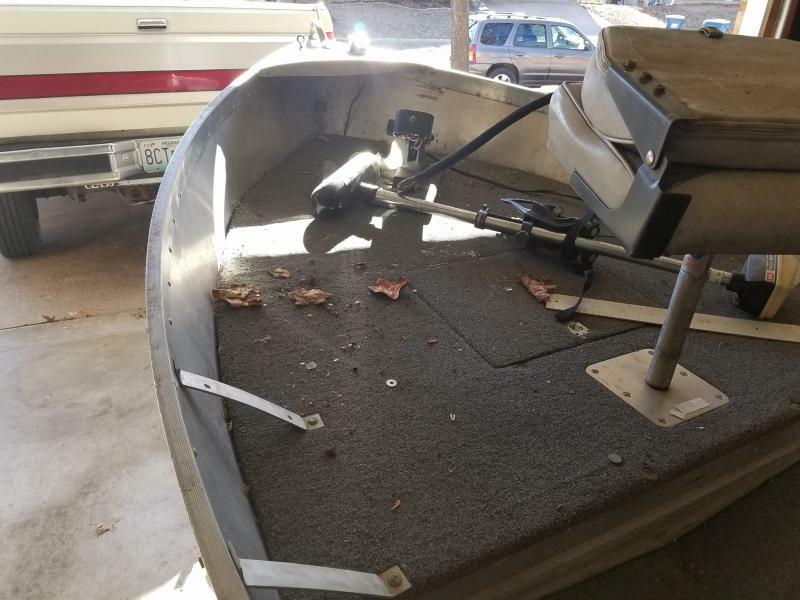 Will only use electric transom and a bow mount trolling. One battery and a lot of tacklr. The pics to my build in my signature.